As I was sitting in Mass this morning, my mind wandered. (Big surprise, I know.) The priest who celebrated early mass was the one who I believe has autistic-like characteristics. His homilies leave much to be desired. He doesn't know how to tie in the gospel (or any of the readings, for that matter) into the homily. I realize church is the last place you should be envious, but as I was sitting there, I envied the people I know who talk about what a great sermon/homily they heard, and how they can relate it to their lives. I'm just not getting it at my Parish. I guess I shouldn't say "my" parish, since I'm not registered in the closest parish to me. and the gloom shall become for you like midday." There are so many things in this reading that could be related to everyday life. Instead, we got a history lesson. I thought he said that Tuesday is the African American National Day of Prayer, but the USCCB website says it's today. Anyway, while the history was interesting, he certainly could have tied the history lesson and the gospel together. I did learn something, though: St. Augustine was a black saint, as was his mother, St. Monica. I had no idea. Not that it matters, in the whole scheme of things! For a list of black/African saints, go here . As an added plus for attending mass this morning, we had the "Blessing of the Throats". February 3rd was the feast day of St. Blaise, who is the patron saint of throat problems, as well as the wool trade. During the Blessing, we approach the altar. The priest or lay minister places crossed candles to our throat and says a blessing. I absolutely love this blessing. I think it has to do with having so many throat problems as a child. It does seem that when I received this blessing I would go through the rest of the winter without any problems. When we were trying to decide on a name for YS, I threw out the name "Blaise". CH didn't like it; in fact, if I'm remembering correctly, he thought it was a little strange. (Not as strange as a name that he threw into the hat, but we're not going to go there right now!) So, YS wasn't named Blaise, but there was a boy in OS' class with that name. (Enter the green-eyed monster.) In all fairness, YS' name fits him, and I can't imagine calling him Blaise. So, yes, the green-eyed monster shows up quite often to taunt me. That's one of the biggest things I have to work on. Any suggestions? I don't have any suggestions. I do like that blessing of the throat. Seems like a good time of year for it! Hi Mary- I can appreciate you not attending your "registered parish." It took us quite awhile to find the right parish with the right priest with the homilies that made us think and inspire us. I realized awhile back that I was busily using my critical spirit to dissect our Pastor's sermons. I was really convicted by it...and after praying about it...decided that I'd pray that God would just show me ONE thing from each Sunday's sermon to apply each week...whether it came to me in the best laid message, or not. Interestingly, I find that I get much more than ONE thing...and ditching the critical spirit helped in all sorts of ways! HA! I hate when church doesn't inspire or motivate. Seems a waste of a good opportunity. I need that "tune up" every week. Oh, and I'm passing the name Blaise on to K and CT for that baby. I like it. PS. I'm not Catholic, but I've always been interested in the saints! I know you're Catholic, but have you considered visiting a Protestant church? 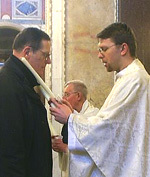 There are very conservative denominations that incorporate rituals similar to Catholic ones. No suggestions, but I, too, have a hard time relating scripture to sermons a lot of the time. I wish our Pastors were better at that. I like church for the traditions, always know what's next, peaceful and restful. Just remember WHERE you are. And WHO you are. You have a great life. I hope you will soon be able to find a parish that fits you. As to dealing with the Green-eyed monster - when it hits me I try to step back and think about all the great things in my life, and look around at some of the stuff other people are dealing with. That usually puts things in perspective for me. Cool that he did the Blessing of the Throats on a Sunday. I have only encountered that in recent years at daily Masses. You and I both know that we don't go to church just for the homily, but I do believe it is part of the "meal". We are fed by the Word of God (includes the homily) AND the Eucharist. Is there somewhere else where you could be "fed"? You know my suggestion for the green-eyed monster....that much maligned sacrament - reconciliation. There we don't work on it alone. So much grace comes from there that things that seem insurmountable are conquered. You drop it as Jesus' feet and He'll pick it up and help you with it. I like what Bobbi said. I think we all struggle with the Green Eyed Monster from time to time...maybe in different ways but its there. I have been in your shoes. We actually switched parished because of that. One thing I was not doing was placing the emphasis on the HOly Eucharist. For Catholics, and I know you know this, that is the central, the entire purpose of the Mass. I try to focus on that Litury of the Eucharist and participate truly at that point. Ask God for help at that point...that is what will be offered up for you. I found a beautiful teaching from the Baltimore Catechism once. I'm sure I do not have the words exact here, but...it says that the Eucharist, the grace in the Eucharist, is our food for our soul and without it, the soul goes hungry. Words are good, but grace is better. I like the comment about picking out one thing in the homily and trying to focus on it. That will help you through the homily and then onto the best part of the Mass, the Eucharist. There are good homilists and then there aren't. Everyone has a gift, and to be a great homilist is such a special gift. As for the green-eyed monster...he is everywhere! We all battle him. Focus on all the amazing blessings in your life. Not sure if that helps. P.S. Karen made probably the most excellent comment when she mentioned reconciliation. My new motto: humility is food for the soul. You must listen to Fr. Corapi if you want inspiration...he is AMAZING!!!! And tells it like it is.